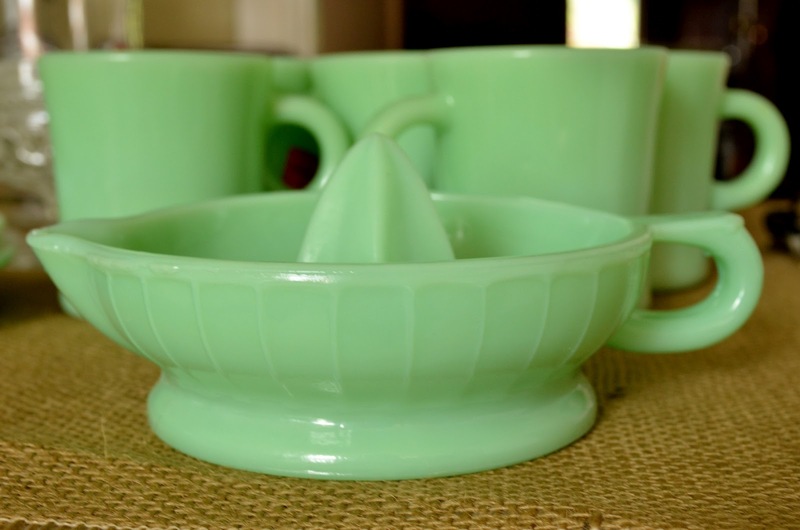 If you tuned into Style Spots this past Monday, you'll remember I happened upon a gorgeous set of Fire-King jadeite mugs and three divided plates, something most thrifters want to do a happy dance over because of how popular and collectible these pieces are. 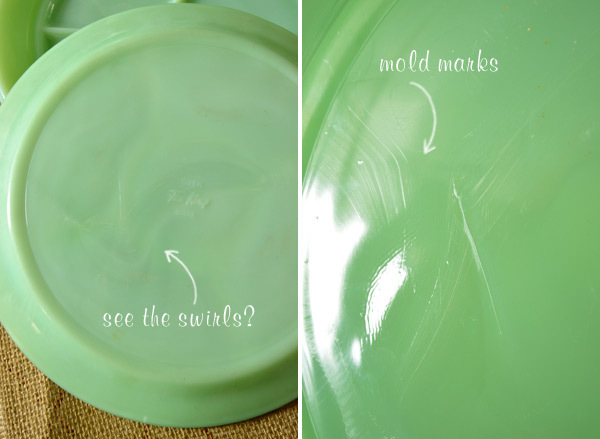 It's funny, though, because, like Depression Glass, when companies starting rolling out jadeite, it was made from scrap glass in molds, meaning it was really inexpensive to produce. As such, it was usually sold at dime stores or through promotions as an incentive for people to buy more of a product to get more of the pieces (i.e. Buy this box of cereal and see what jadeite piece is in it, then buy some more to collect the set). Now, more than 50 years later, one little mug is fetching a minimum of $25 online. Crazy. Since I've decided to sell the plates and a smaller set of the nine mugs I have (I mean, come on, what vintage-lover doesn't want to keep a little of this minty goodness for herself? ), I knew I'd better do some research to find out when the pieces were produced. There has also been an insane amount of reproduction pieces floating around (as so happens when something becomes super collectible), so I wanted to make sure these weren't some of them. I figured I was okay since all the pieces have some form of Fire King marked on them, but you never know. 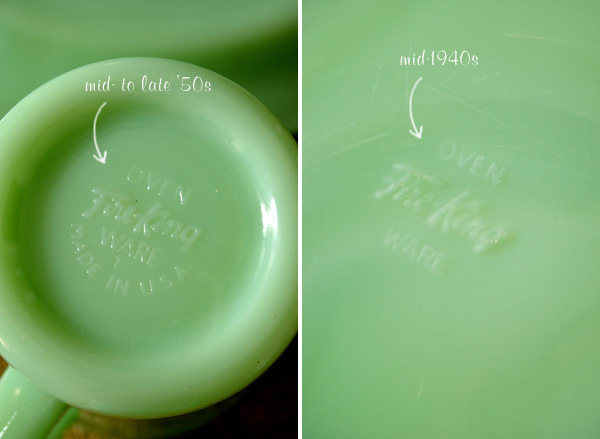 Based on this, the mugs I have are from the mid- to late 1950s, and the plates I'm guessing are maybe mid-1940s because they only say "OVEN Fire-King WARE," but "Fire-King" is in script. I also learned that, unfortunately, Jeanette and Fire King didn't mark all of their pieces, whether it was because they were made for department stores who wanted to use their own logo, or for promotions where the advertiser wanted the piece to be unmarked. As such, just because you have a piece that is unmarked, it doesn't necessarily mean it's a repro, you just have to do more research. Such is the case with this juicer I picked up at a flea market (luckily for a low price). It has no markings on it whatsoever, but it also seems a bit too "moldy" for me; the edges and the handle have a weird unevenness that isn't there in the other pieces. I'm leaning toward this being a fake, even though the color is spot-on. What do you think? I love this post so much, as I have a collection myself! Thanks for sharing your research! The thrifts around here think Jadeite is gold, so I usually don't get much of a deal IF I find a piece worth buying! Glad you enjoyed reading the post! So crazy trying to identify all this glassware. And I agree, there are definitely some stores that have learned what it is and price it accordingly. I can't blame them, really, but it is frustrating! Love Fire King. This is such a great post about it. Good Job! I'm swooning just listening to that description! :) Lucky lady! I just picked up a piece at a vintage sale today. I paid 56 dollars for a Chicken Dish, but it isn't marked. I didn't really know much about Jadeite but loved it because it looked like something My Aunt Betty had in her house ages ago. Sadly, I think it is fake. It has NO markings on it whatsoever, but there are swirls in the glass. Also, there are a few places with pitted marks which could be air bubbles? There is also a spot in the glass that almost has a brown hue under the chickens neck. What do you think? Hey Amanda! Well, I'm definitely no expert, but it's possible it could be real since, as I mentioned, some of the pieces made for department stores were left unmarked. I haven't really seen pieces that have a brownish hue to them, so that could be a telling sign. Do you have a piece you know is real that you can compare the look and feel of this one to? My father collected Jadeite for awhile and has passed his collection on to me. I currently live in a small rental house but as soon as I move somewhere bigger, my collection on display! I am saving bookmarking this posting so I can date my pieces. Thank you! I love Jadeite! I have one piece, but really would love to expand my collection. Beautiful. thanks for the tips. So glad you find some useful information, Leah! Good luck on your search! Thank you so much for posting! My parent's are cleaning out my great uncle's home that they have owned since his death 29 years ago, but haven't had a chance to really dig. 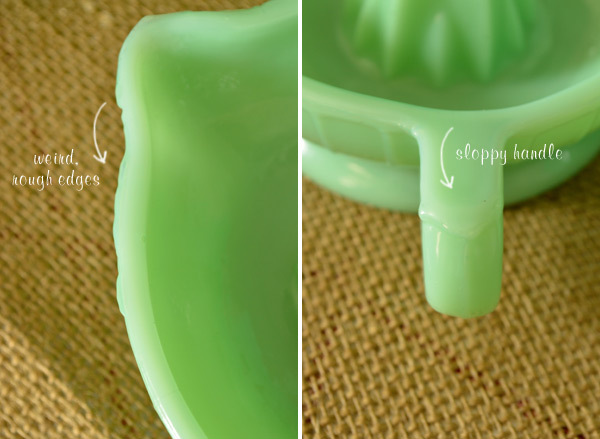 There are some lovely Jadeite Fire King pieces they have given me, and I am so grateful for the information on them!